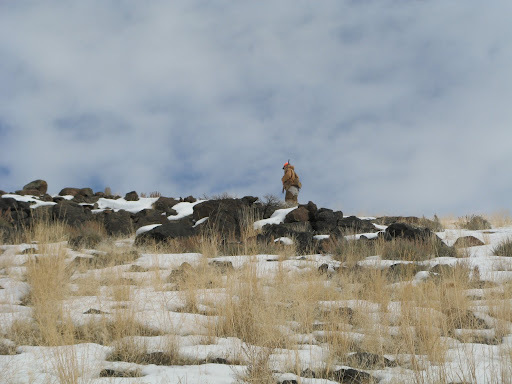 For those who struggle with the doldrums of winter, chukar hunting in January offers a good reprieve from Ol’ Man Winter’s icy grip. 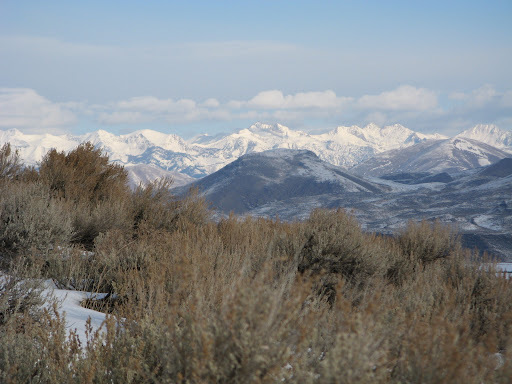 In Idaho, chukar hunting season runs from the latter part of September, when most other game bird seasons are open, through January 31st of the following year. However, in January, along with Hungarian partridge and valley quail, chukars are the only show in town for upland game enthusiasts. 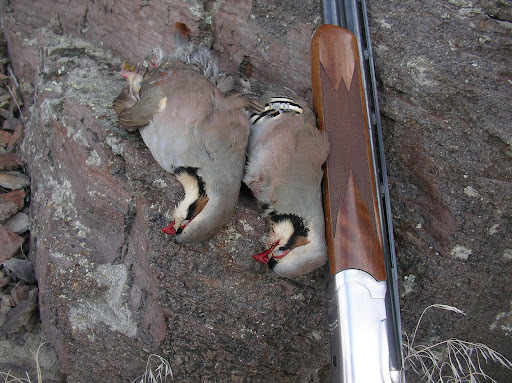 Chukars are birds of the high desert and are generally found on steep south facing slopes capped by rim rocks. 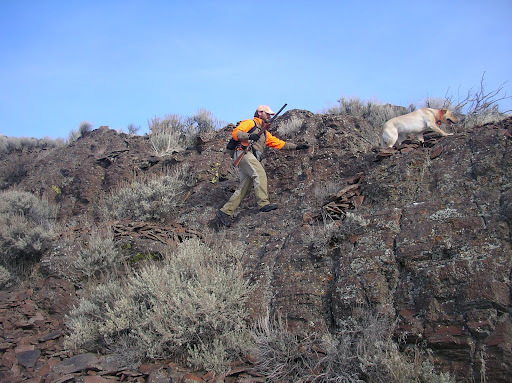 Idaho’s constant wind tends to keep these slopes exposed so that chukars can access their favorite food, cheat grass. 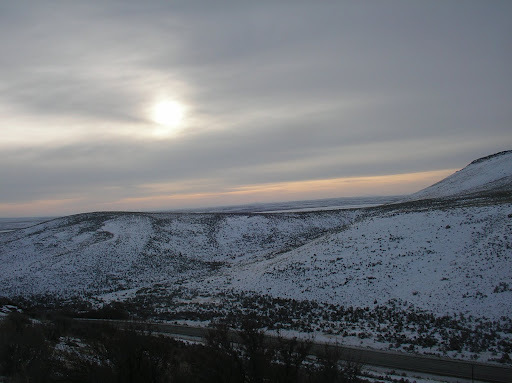 To the unknowing, chukar habitat might be considered as wasteland, especially in January. Find the habitat, however, and you will mostly likely find the birds. 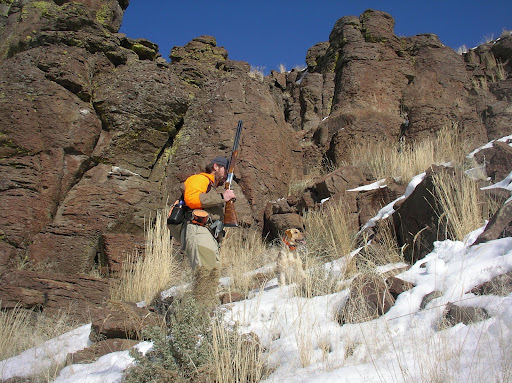 Generally, these birds can be found from Arco to Boise, but the best hunting in the state occurs in the west near the Owyhee Desert and Brownlee Reservoir. For the hunter who does his homework, there are plenty of other good places to pursue this magnificent game bird. 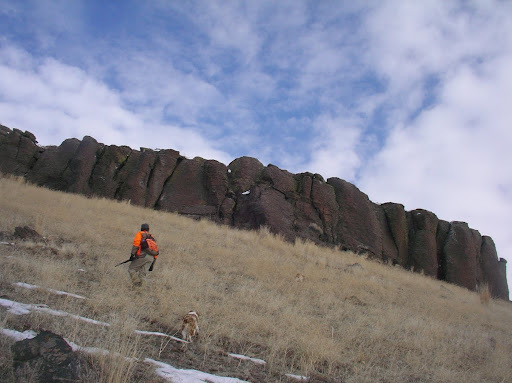 In fact, some areas of western and northern Idaho hold chukars, quail, and huns giving the gunner a wider variety to pursue. If you go, make sure you wear good hiking books as the footing can be sketchy, if not downright terrible. Also, wear layers of clothing that can be removed and added as necessary. With the physical exertion of hiking after these devil birds, you can actually get downright hot. Yet with January’s piercing winds, the heat wave can be short lived. So it pays to be prepared for whatever the weather throws your way. 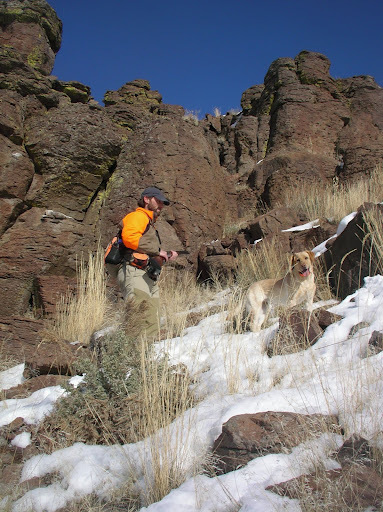 Hunting these birds with a good dog will not only increase your enjoyment of this sport, but will also help you bring to hand those birds that you manage to scratch down. A wide ranging pointing breed is helpful, if it will hold the birds till you can catch up. However, an undisciplined , self-hunting dog will do more harm than good, as you watch him flush birds to the horizon out of range. Maintaining control of your dog is a must to be successful in this game. An e-collar is a humane and effective way for you to keep control of your canine cohort. 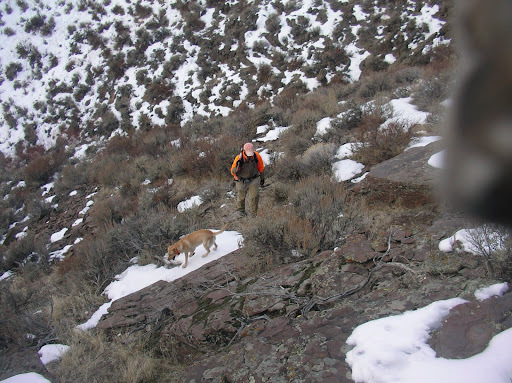 As a word of warning, chukar hunting is not for the faint of heart. These demonic birds run straight up hill and fly down . . . extremely fast. 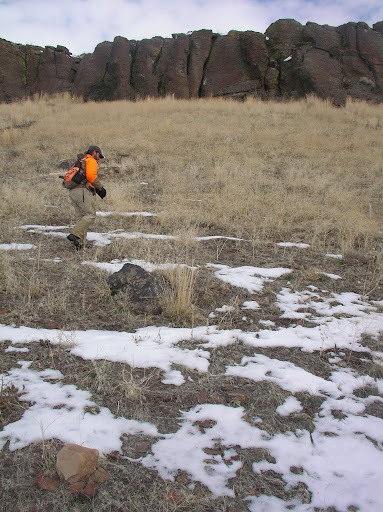 To put it lightly, the rugged terrain can be difficult and the hunter is often winded when a covey flushes. When they turn on their afterburners, chukars can really sizzle a gasping gunner. By way of advice, get above the birds if you can, swing fast, and use a ridiculous lead to overtake these speed demons. 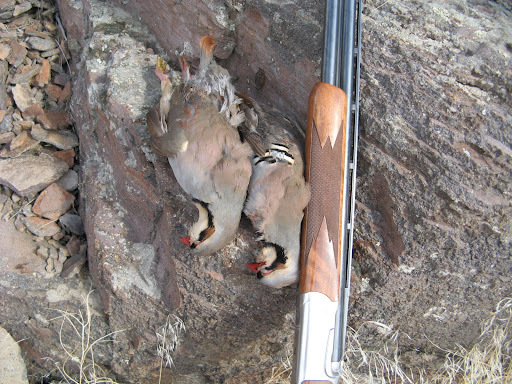 Should you be lucky enough to harvest a chukar, the effort is well worth it as they are delicious. However, the birds are just a bonus. Great "Where-to…" Looks like you and Matt had a beautiful day up there! Love the pics. The last one in particular, is really pretty. Nice article and great pics again. 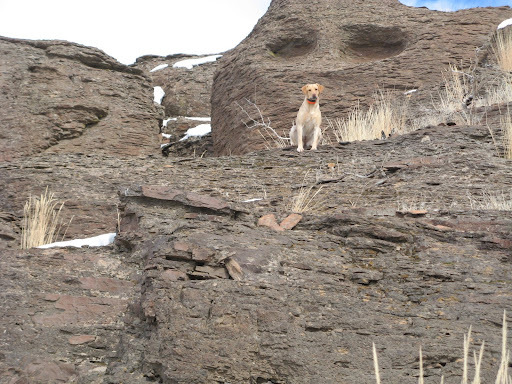 I especially like the pic of your pup sitting in front of the rock. Doesn't look any easier than it was last year, Andy. Wish I could try it again.